Football officials huddle before the start of the Rhea County Golden Eagles vs. East Hamilton Hurricanes game Friday night in TSSAA football action at East Hamilton High School. On any given Friday night throughout the football season, at numerous locations, there always are three teams taking the field for a high school game. Yes, three teams, not two. And the teams in that third group, the officiating crews, are made up increasingly of figurative seniors and juniors. They are in desperate need of some freshmen. "What we are seeing is that we have some new officials and the new ones that we are getting are in their late 40s, early 50s, and we are glad to have them but that is not what we are looking for," said Craig Phillips, the assigning officer for the Tri-County Football Officials Association. "The future of the game is really, really on shaky grounds." There are a multitude of reasons for the problem, but one sticks out more than any other. The National Federation of State High School Associations has described it as a "culture of abuse," and it is something every official deals with. It has a lot to do with why recruiting and retaining high school officials has become a challenge. Gene Menees, a TSSAA assistant executive director, said that in questioning potential recruits for officiating, the first response rarely is "What will I have to do?" or "What do you pay?" "When I talk to younger people, especially former high school athletes, they will say that they don't really want to put up with all of the stuff that they hear coming out of the stands and off the sidelines," Menees said. "That's a pretty common thread." And it's making it harder and harder to get officials on board — and to stay on board. "The lack of respect for an official is a huge problem, and I think that drives a lot of people away," Phillips said. "It's hard to get somebody new to come in, and the first thing that happens to them in a little league football game with 5- and 6-year-olds is a parent going crazy on them." It's a lot to put up with, for anyone. Tyler Love has been officiating various sports in the area since he graduated from high school, and being able to block out the noise of the fans has not been particularly easy. It definitely didn't happen overnight. "It comes with experience," Love said. "The earliest you can officiate is right out of high school, so when I started out I was very young and it was very nerve-racking. To be honest, it took me five or six years before I finally just realized that you have to tone it out, you have to ignore it, but it is hard." While this culture continues to limit the number of people wanting to get involved in officiating, the shortage continues to grow. That keeps Phillips holding his breath every Friday night. "If I have a heavy week and I have all my officials booked for games, I am just sitting around praying that nobody gives me a call and has a family emergency or a work situation to where they have to cancel, because we just can't cover it," Phillips said. However, according to Menees, the number of officials across Tennessee is at a good number and has remained consistent throughout the past few years. The problem lies in more schools popping up, and thus more games with the same number of officials as before, and this isn't just a football problem. "We have more schools than we have ever had, which means that we have had more games than we have ever had," Menees said. "This concern is in all sports, not just one or two." As far as the "culture of abuse" goes, the answer can be simple if administrators and coaches take action against derogatory and malicious comments thrown at officials on the field or court. No one is ever going to be perfect, and while we all care greatly about the outcome of the games we love, it shouldn't come at a cost of someone else's mindset. As far as gaining more officials to cover the new games being added across the state, that answer is a little more complicated. Getting the word out helps, and explaining the benefits of a part-time job as an official helps as well, but Chattanooga could be facing the potential of having to ask some high schools to move varsity games to Thursday nights. "It hasn't gotten to the point yet, but I can see that in time, if things don't turn, where we might have to ask schools to consider playing on nights other than Friday," Phillips said. 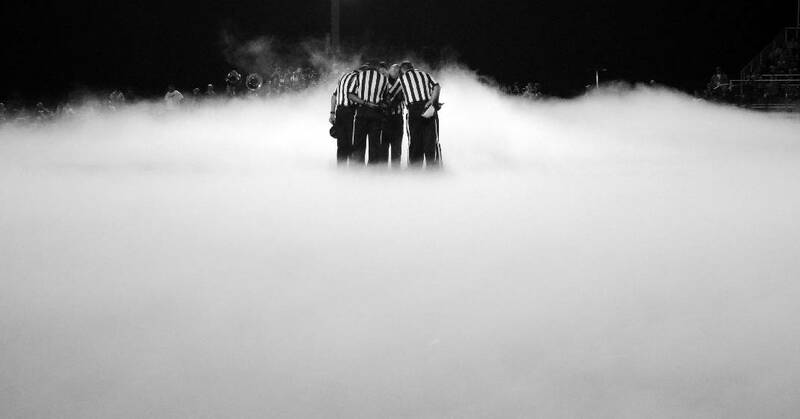 "I hope it never happens, because Friday night is for high school football." A move to Thursday games already is happening in Tennessee, the city of Memphis being an example of local associations having to ask schools to try alternate nights to play. The shortage of officials in the area is a problem that needs to be fixed, but that is easier said than done. "We have tried everything," Phillips said. "I think that is a question that there is no answer for. We have scratched our heads and tried everything in the world to try. I don't have an answer." Anyone interested in working as a high school official in the area can visit highschoolofficials.com or contact Phillips at craig.phillips@tn.gov. Contact Tori McElhaney at sports@timesfreepress.com.